Corning Cable Systems Indoor Buffer Tube Fan-Out Kits are specifically designed for the termination of 6- and 12-fiber buffer tubes. These buffer tube fan-out kits provide the ultimate solution for those users who want to field-install connectors on 250 μm coated fibers. 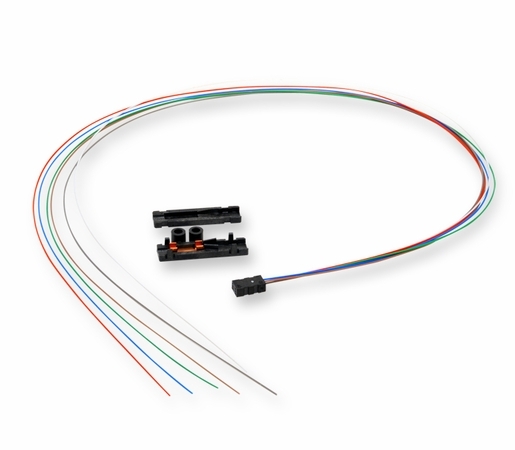 The kits provide the most compact, easy-to-install fan-out solution requiring no additional hardware or space than that required for terminating tight-buffered cables. Indoor Kits feature a 900 μm Fan-Out Assembly that is color-coded to match the fiber color scheme. The Fan-Out Assembly is available with 6- or 12-fiber units in lengths of 25 inch or 36 inch. These different lengths provide the installer the flexibility needed for a variety of hardware options.